Sunday evenings in early America were special times. 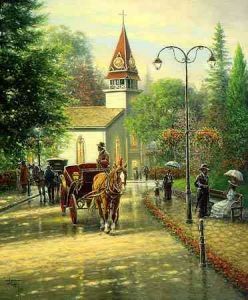 Strolls through the park and carriage rides after evening church services were common occurrences. Time seemed to move slowly in those days; family and friends enjoyed simpler things. We hope you enjoy the beauty and serenity of "Chapel Street."